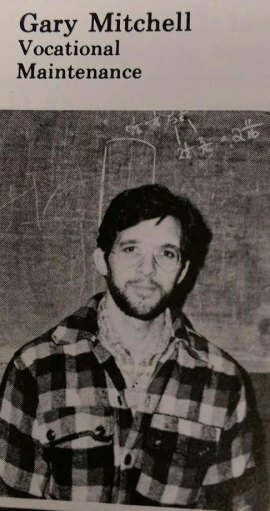 Gary's teacher photo from the 1981 Ocracoke School yearbook. Gary Mitchell fell in love with Ocracoke over a Thanksgiving vacation in 1976, and decided to send a letter to Principal Cutler, at Ocracoke School. “I graduated from NC State in 76, I had a teaching degree, I decided I wanted to try teaching,” he recalled in a recent interview. His letter came to Principal Cutler at an auspicious time – he had just been told that he could hire a full-time shop teacher. “I sent a letter on a Tuesday and he called me on Wednesday,” Gary said. Although this was Gary’s first time running a classroom, it wasn’t his first shot at teaching people how to fix things. He and a friend had run a business called “Your Garage” which was a self-service auto repair shop, where they provided the tools, and taught people to work on cars. Gary taught shop for three years at Ocracoke School, before deciding he would like to run his own business making wooden toys. In the late eighties he and his wife Kitty moved to Stoneville, NC, where he once again taught shop class. Gary in his new classroom in 2017. “Kitty was wanting to teach at Ocracoke and in 1991 the Art Teacher job here was open,” so back they came to the island, and in the mid-90s Gary and Kitty formed the band Molasses Creek, and Gary started being a full-time musician. This role as bandleader and music producer is probably what most people on the island know Gary as now, and he’s ready to show a different facet. “I’m excited to make things with my hands again,” he said. I asked what sort of projects the students would be working on, envying them fiercely already (I had Mr. Randy throw a knife at me, anything’s better than that). 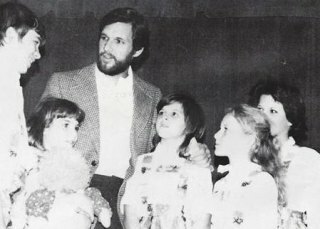 Gary in the Ocracoke production of "The Sound of Music" in 1981. In addition to these skills, carpentry, woodworking, electrical and even plumbing are on the menu.